Awards season is well underway. There’s no stopping it now. The Golden Globe nominations have already been announced, which means that the Oscar nominations cannot be far behind. The coming weeks and months will see many ceremonies, speeches, and demonstrations of false humility, all supposedly in the name of cinema. The upside of this, one supposes, is that it gets people talking about film. 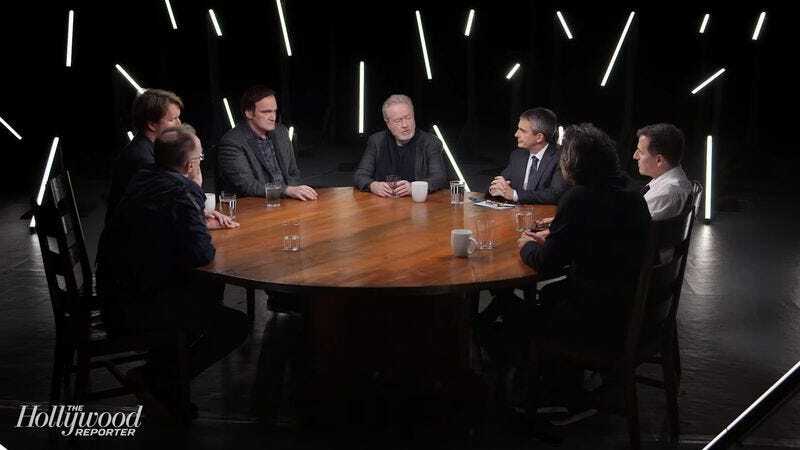 In that spirit, The Hollywood Reporter has gathered six of the year’s top directors for an hour-long roundtable in which they discuss the finer points of their craft. The participants include Quentin Tarantino (The Hateful Eight), Ridley Scott (The Martian), Tom Hooper (The Danish Girl), Danny Boyle (Steve Jobs), Alejandro González Iñárritu (The Revenant), and David O. Russell (Joy). Hollywood Reporter features editor Stephen Galloway presides. The elephant in the room, that TV is largely eclipsing cinema these days, is brought up early on (by Tarantino) and then largely forgotten for the rest of the hour. The conversation, perhaps frustratingly, is quite cordial and pleasant throughout. There are no major blowups or awkward confrontations here. Once the enfant terrible of independent cinema, David O. Russell emerges here as an even-tempered and thoughtful fellow, not the kind of guy who would start a shouting match with Lily Tomlin. Tarantino is animated and garrulous as always but does not dominate the conversation in the way one might guess. Galloway makes sure all the directors, even the taciturn Hooper, get a chance to talk. A couple of the directors are coming off “tough” experiences, but no one seems burned out. Boyle admits that Steve Jobs’ icy box office reception in America was “bruising,” but he seems to have retained his optimism. And the fact that Iñárritu’s film faced numerous production difficulties and went way over budget is treated lightly. The director says he’s too exhausted to even think about his next project, yet he’s also one of the more passionate participants in the roundtable, clearly thrilled to be making movies for a living. The one to watch here, really, is Scott, who openly admits he makes movies for himself and has some fascinating anecdotes about Blade Runner, Gladiator, and Stanley Kubrick to share.